+1C/+4C anomalies surfacing over Nino3 between 120W-100W. We could see a strong El Niño coupled with a solid +AMO this year. This combination actually occurred a number of times in the late nineteenth century. Therefore, we may end up with a hyperactive EPAC season and a near-average Atlantic season, rather than a well-below-average outcome in the Atlantic. 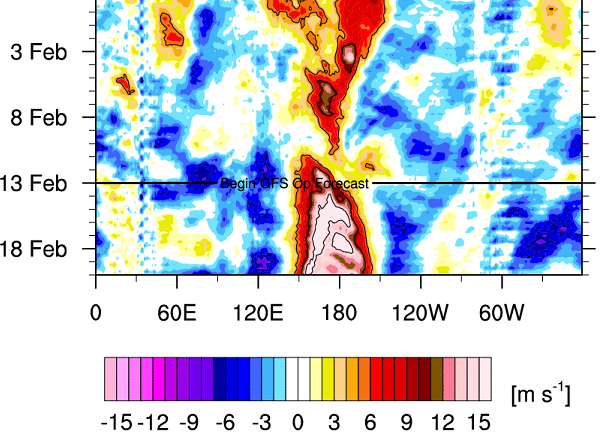 I think the biggest effects of a full fledged El Nino towards the Atlantic hurricane season is wind shear. The SST configuration over the Atlantic can be a favorable setup but anything that gets into the Caribbean will likely get shredded. GFS not budging on the WWB strength and is also beginning to verify. Euro low-balled this going in. Starting to verify in real time kudos to the GFS. SOI tanking now. Should continue to tank through February. The 1st Thursday of March I believe the CPC will issue an El Nino advisory. That's because the 30 day avg for January was -2.24 and for February it'll be around -10 if not lower. I think that's what the CPC has been waiting to see. Don't have time to run numbers for the SOI but I'm sure it'll close February in El Nino territory (lower than -8). 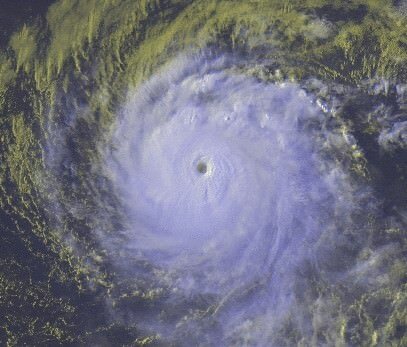 Kingarabian wrote: I think the biggest effects of a full fledged El Nino towards the Atlantic hurricane season is wind shear. The SST configuration over the Atlantic can be a favorable setup but anything that gets into the Caribbean will likely get shredded. Atlantic does indeed influence, also does Indonesia. If anything the past 90 days or so Indonesia has been a deflector stunting the Nino growth late Fall and early Winter. 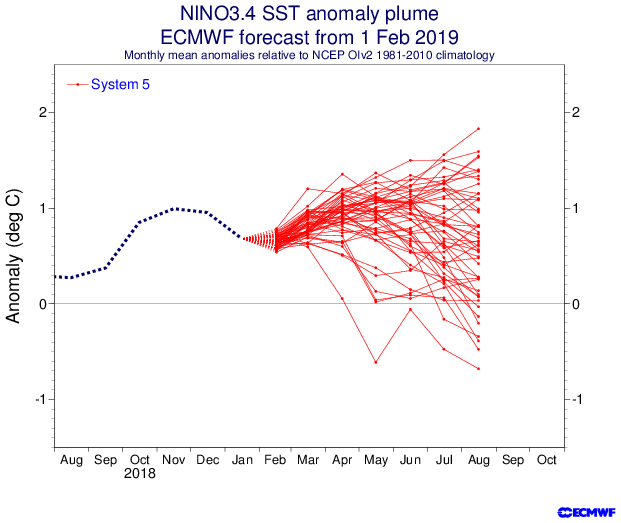 Synopsis: Weak El Nino conditions are present and are expected to continue through the Northern Hemisphere spring 2019 (~55% chance). El Nino conditions formed during January 2019, based on the presence of above-average sea surface temperatures (SSTs) across most of the equatorial Pacific Ocean [Fig. 1] and corresponding changes in the overlying atmospheric circulation. The weekly Nino indices remained above average during the month, although decreasing in the Nino-3 and Nino-3.4 regions [Fig. 2]. However, the Nino-4 region remained elevated, with a value of +0.8°C in early February. Positive subsurface temperature anomalies (averaged across 180?-100?W) increased in the last couple weeks [Fig. 3], in association with a downwelling Kelvin wave that contributed to above-average temperatures in the central Pacific [Fig. 4]. 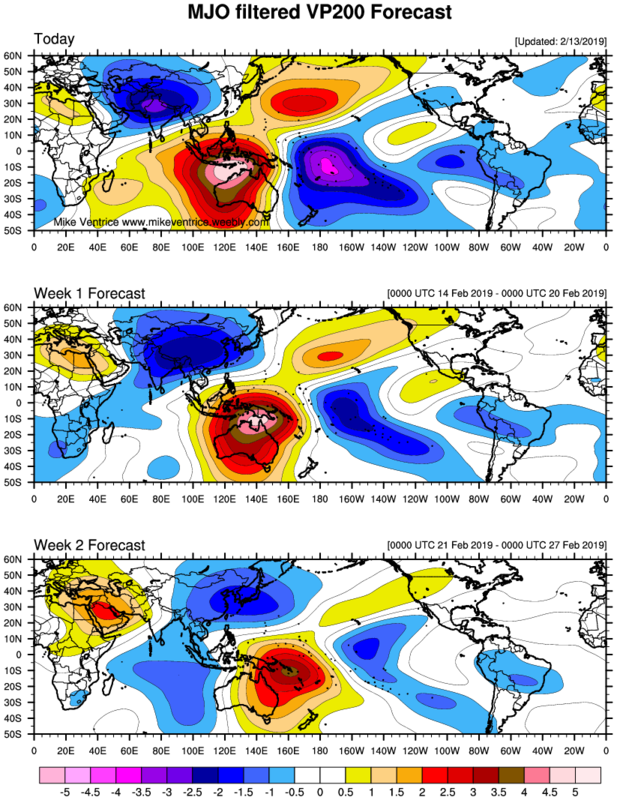 Compared to last month, the region of enhanced equatorial convection expanded near the Date Line, while anomalies remained weak over Indonesia [Fig. 5]. Low-level wind anomalies became westerly across the western Pacific Ocean, while upper-level wind anomalies were mostly westerly over the eastern Pacific. The equatorial Southern Oscillation index was negative (-0.6 standard deviations). Overall, these features are consistent with borderline, weak El Nino conditions. The majority of models in the IRI/CPC plume predict a Nino 3.4 index of +0.5°C or greater through at least the Northern Hemisphere spring 2019 [Fig. 6]. Given the recent downwelling Kelvin wave and the forecast of westerly wind anomalies, most forecasters expect SST anomalies in the east-central Pacific to increase slightly in the upcoming month or so. Because forecasts through the spring tend to be more uncertain and/or less accurate, the predicted chance that El Nino will persist beyond the spring is 50% or less. 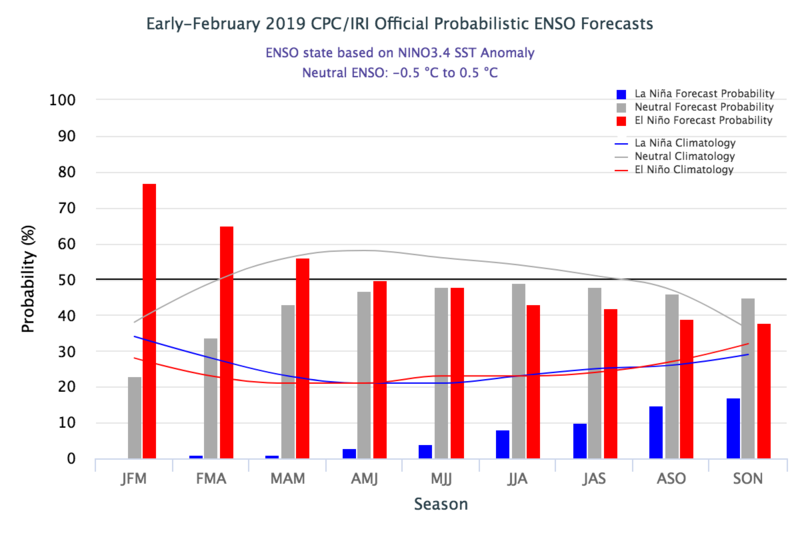 In summary, weak El Nino conditions are present and are expected to continue through the Northern Hemisphere spring 2019 (~55% chance; click CPC/IRI consensus forecast for the chance of each outcome for each 3-month period). What’s new over the past month is that we’re seeing signs of El Niño-related changes in the atmosphere, with increased clouds and rain in the central Pacific indicating a weaker Walker circulation. One measurement of the strength of the Walker circulation, the Equatorial Southern Oscillation Index, was -0.6 during January, indicating more rising air than average over the eastern Pacific, and less than average over the western Pacific. These changes are enough evidence that the atmosphere is responding to the warmer ocean, leading us to conclude we have El Niño conditions! The future remains to be seen, but forecasters give weak El Niño conditions the edge through the spring. After that, chances of a continued El Niño drop below 50%. It’s tough to make a successful forecast for later in the year, due in large part to the “spring predictability barrier,” a notoriously tricky obstacle for computer models. Spring is a time of year when ENSO (El Niño/Southern Oscillation, the entire El Niño and La Niña system) is often transitioning, making it especially difficult to predict what comes next. A bit late to the party. ONI had reached the threshold SON in the Fall late. They declared it a bit sooner than 2014-2015 but you could see the similarities. I don't think the CPC had a choice given ONI was going to get there despite mixed signals from the atmosphere. I think Mike Ventrice has the better idea of noting ENSO as a spectrum with unique differences. Weak-Mod-Strong Nino/Nina by ONI is a good standard but there is a better way in a spectrum that captures the subtle differences and nuances of atmospheric coupling. Official declaration requires SST anomalies in Nino 3.4 to be +0.5C or greater for a 3-month period. As January data are now in, the period of Nov-Jan qualified for El Nino, even though El Nino has already peaked. Looks like the previous graphic I posted did not have all the members included. This graphic has more members showing El Nino conditions for the start of the hurricane season, with the mean centered near a moderate strength El Nino. We'll see if this happens as the ECMWF calls for an El Nino every year. Kingarabian wrote: Looks like the previous graphic I posted did not have all the members included. This graphic has more members showing El Nino conditions for the start of the hurricane season, with the mean centered near a moderate strength El Nino. We'll see if this happens as the ECMWF calls for an El Nino every year. Accounting for bias, would look like weak-mod (imo) El Niño, which makes sense. Anywhere from La Niña to borderline strong El Niño makes sense to me so far. Definitely lots of uncertainty once again.